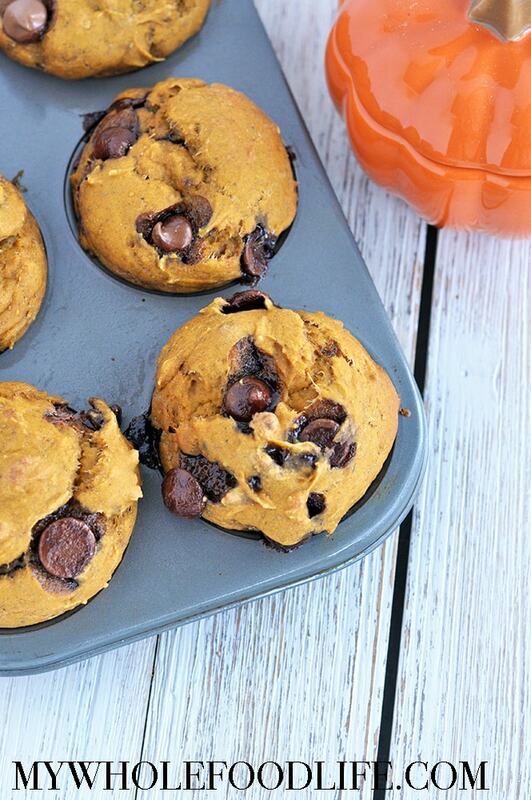 The perfect blend to pumpkin and spices with bursts of chocolate chips. Vegan and gluten free! In a large bowl, mix all the dry ingredients except the chocolate chips. Stir. In a large mixing bowl, add all the wet ingredients. Mix well. Add dry to wet and mix until combined. Fold in the dark chocolate chips. Spoon batter into lined or greased muffin tins. Bake in the oven for 12-15 minutes or until a toothpick comes out clean. Let the muffins cool before trying to remove them from the muffin tins. Once cool, store the muffins in an airtight container in the fridge. Enjoy! These muffins should last a couple weeks in the fridge. They can also be frozen for up to 6 months. © 2018 My Whole Food Life. All rights reserved.